The toxic effects of this type of Electromagnetic Field (EMF) have been associated with a variety of health and safety concerns internationally, cancer being the most profound. 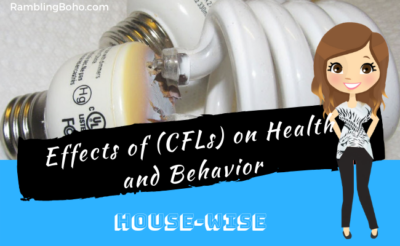 Studies through Global Health in Canada, Dr. Havas, and others detail how and why CFLs cause health and behavioral problems, pointing toward Light Emitting Diodes (LEDs) as the current safe and green lighting solution. CFLs are energy efficient because they generate radio frequency radiation and Ultra Violet (UV) radiation, without the vast amount of heat emitted by incandescent bulbs (Dr. Havas’s report). UV radiation occurs when mercury is excited by electricity. It interacts with chemicals inside the bulb to create light (Dr. Havas’s report). The CFL bulb, unlike CFL tubes (larger fixtures often seen in offices and warehouses), does not have an enclosure to filter the UV rays. Radio frequency radiation falls under what is known as Intermediate Frequency (IF), as classified by the World Health Organization. Concerns have risen over electromagnetic interference (EMI) by IF because IF is biologically active. Scientists currently speculate on adverse health effects in relation to this biologically active frequency (Dr. Havas’s report). Aside from preliminary concerns raised over UV and radio frequency radiation, CFLs contain dangerous levels of mercury that pose a threat to the home or work place if broken, and are difficult to recycle (Dr. Havas Interviews, by environment columnist Geeta Nadkarni; http://www.magdahavas.com/2009/10/06/the-dark-side-of-the-cfl/). According to Bryan Nelson of the Ecolocalizer, “Some tests have demonstrated concentrations of mercury in factory workers that were 150 times the accepted standard, and many are frequently hospitalized. In one Chinese factory, 121 out of 123 employees had excessive mercury levels.” Clearly, the production of CFLs extends beyond environmental hazards. Dr. Magda Havas took part in comparative studies concerning the use of CFLs and individuals suffering from health disorders. CFLs fall under the Umbrella of “Dirty Electricity” Those suffering from Multiple Sclerosis (MS) saw an improvement in neurological symptoms in an electromagnetically clean environment, and experienced an adverse reaction when dirty electricity was introduced. School students suffering from asthma were able to relinquish use of inhalers around clean electricity. Diabetics experienced an increase in blood sugar levels around dirty electricity and normalization when the environment was electromagnetically cleaned. Noted symptoms from CFLs fall under the following categories: Neurological, cardiac, respiratory, dermatological, ophthalmologic, and other (Dr. Havas’s report). Individuals may suffer from light or electro sensitivity, headaches and migraines, worsened skin conditions or rashes for those with Lupus or sensitive skin; fatigue, difficulty concentrating, aches and pains, and more. A highly speculated link to continued CFL exposure is cancer. According to MSNBC’s coverage of the Prevention Magazine article “Is ‘electrosmog’ harming our health?” numerous cases of cancer at La Quinta Middle School were reported. The school had installed Compact Fluorescent Lights throughout the property. “By 2005, 16 staffers among the 137 who’d worked at the new school had been diagnosed with 18 cancers, a ratio nearly 3 times the expected number. Nor were the children spared: About a dozen cancers have been detected so far among former students. A couple of them have died” (http://www.msnbc.msn.com/id/34509513/ns/health-cancer/print/1/displaymode/1098/). Epidemiologist Sam Milham visited the school to find that the high frequency voltage transients that polluted many of the classrooms were higher than he could gauge on his meter. His conclusion was that continued exposure to those transients could increase the risk of cancer by 64%, and by 21% in a single year of work at that location. Abraham Haim, a chronobiologist from the University of Haifa, was part of a study that compared breast cancer rates between areas of low, average, and high artificial lighting. The study concluded a positive relationship between breast cancer rates and exposure to artificial light, with the bluish light emitted by CFLs being especially dangerous. Abraham also stated that fluorescent bulbs stifle the production of melatonin more than incandescent bulbs (http://reason.com/blog/2008/02/20/compact-fluorescent-lights-cau). With the push for energy independence as major as it is necessary, LEDs have become a key proponent toward a solution. LEDs do not emit toxic radiation, do not contain mercury and are not a health hazard if accidentally broken (http://www.magdahavas.com/2009/10/06/the-dark-side-of-the-cfl/). With the highest quality of light, LEDs burn brighter, last longer and emit farther-reaching light, all at a fraction of the voltage of the average incandescent bulb. The payoff is greater than the investment due to a decrease in energy and utility bills. Compact fluorescent lighting, composed of UV and radio frequency radiation, contributes electromagnetic emissions harmful to both humans and the environment. With the phase-out of incandescent bulbs in the near future and a surge in activities and appliances that contribute to dirty electricity, the path is paved for potential health disasters. LEDs are undoubtedly the track to be on for safe and efficient lighting. Taken, in part, from this post on: http://theswap.com/forum/Blah.pl?m-1271786884/ All of which I have sat and researched. I have long been opposed to CFL, not only because I know first-hand that they induce migraines, but also the contained mercury issue. I was unable to read in school during my entire school career due to fluorescent lighting. When I tried CFLs in my home, the migraines I struggled with as a student, returned exponentially. If you were to break a CFL on your carpet in your home, the mercury exposure causes such a health hazard, that you need to cut & remove the carpet on which it was exposed. The mercury exposure in CFLs are dramatically worse than that from canned tuna. I will not have CFLs in my home and risk my children’s health 5, 15, 30 years into the future. Incandescents have been used since their invention, and when they become unavailable due to the government’s intervention, I will use LEDs.